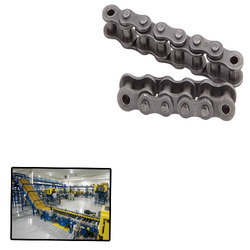 Pioneers in the industry, we offer roller chain for material handling from India. We are one of the prominent manufactures and supliers of Roller Chain for Material Handling. Latest machines and advanced technology are employed in the manufacturing process following standards & norms of the industry. Post-production, these chains are inspected on certain well-defined parameters of quality in order to rule out every possibility of defect. Looking for Roller Chain for Material Handling ?